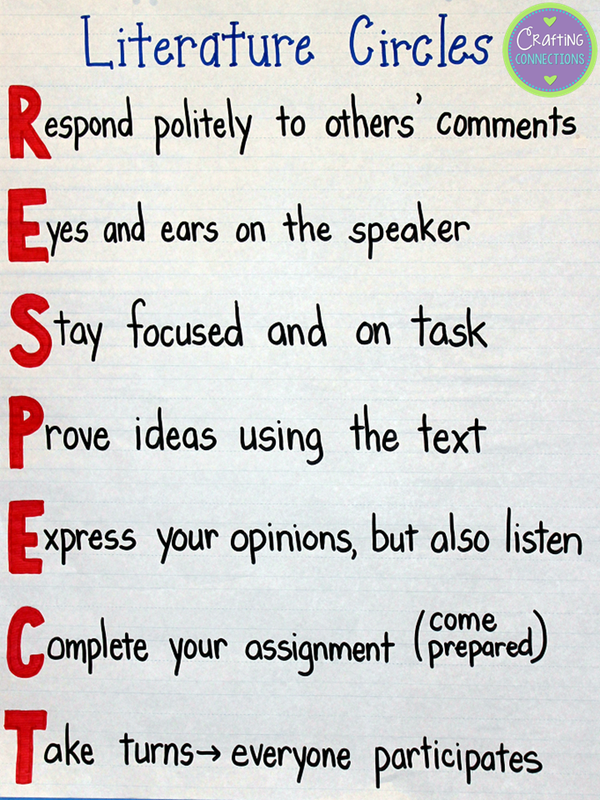 Literature Circles Anchor Chart... it's all about RESPECT! Brooke, my second grader, came home from school a few weeks ago with RESPECT written down the side of a sheet of paper in capital letters, and I could see that she had started turning it into an acrostic poem. I asked her about the partially-completed poem, and she explained that they had talked about respect in their Character Education special, and that she and her classmates had each started to write an acrostic poem to explain what respect meant to them, but then they ran out of time. At the time, I was writing blog posts about literature circles on my own blog (read my post here), and on my Upper Elementary Snapshots collaborative blog (read it here), and it immediately struck me how well this activity would work when literature circles were being introduced to students in an upper elementary classroom! After all, being a respectful literature circle participant requires each member to act responsibly for the good of the whole group. In order for a literature circle to run efficiently, each member has to follow some group norms. In the past, I have always discussed with students the responsibilities of literature circle members, and how one person's actions/behaviors can affect the entire group. The next time I organize literature circles, though, I plan to create an anchor chart with students. I envision ending up with an anchor chart like the one above. I may have to steer the discussion in a certain direction at times, but I truly thing the key ideas listed above will end up on a class-created anchor chart in some fashion. Do you have any activities/minilessons that you always do when introducing literature circles to students? Please share in the comments section... I'd love to hear them!